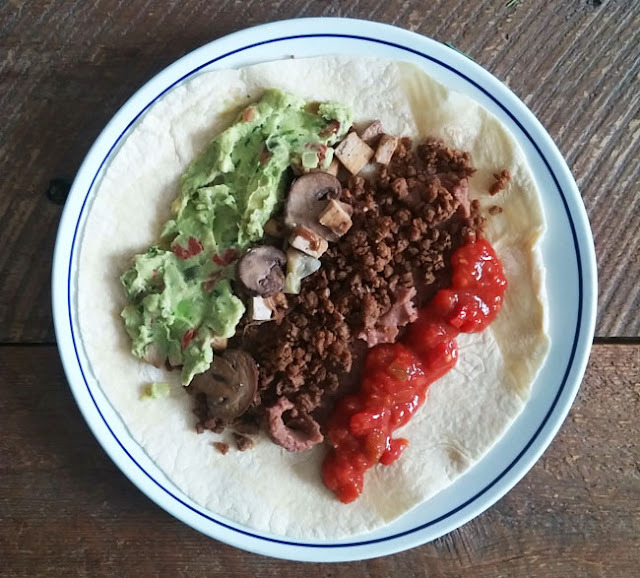 I have been highlighting some of my favourite vegan cookbooks on the blog this month for Veganuary (when people switch to a vegan diet for the month or longer). 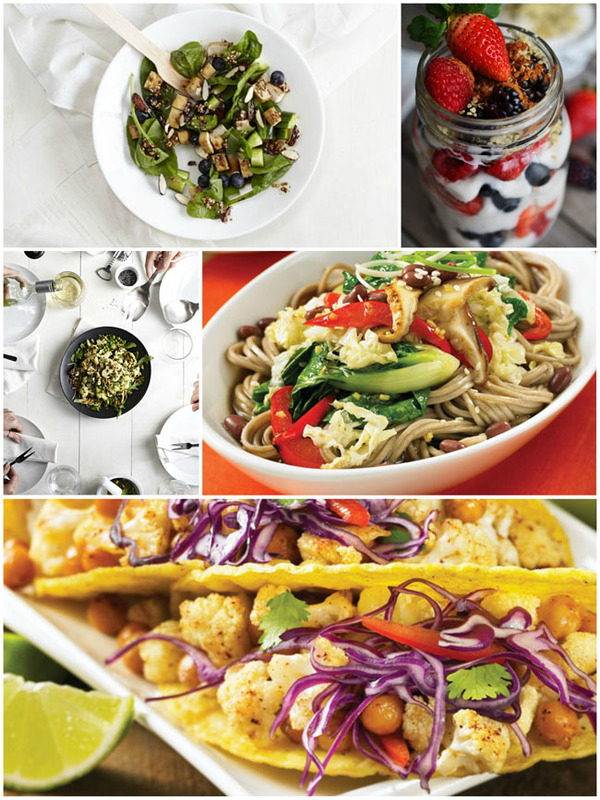 Not surprisingly, most vegan cookbooks are focused on good health in addition to delicious vegan recipes. So, even if you aren't planning to go vegan, they are a handy resource to have on your bookshelves in your quest for better eating habits. Naturally this month I have been examining my own diet a little more closely and cutting back on some of the refined sugars I normally consume. 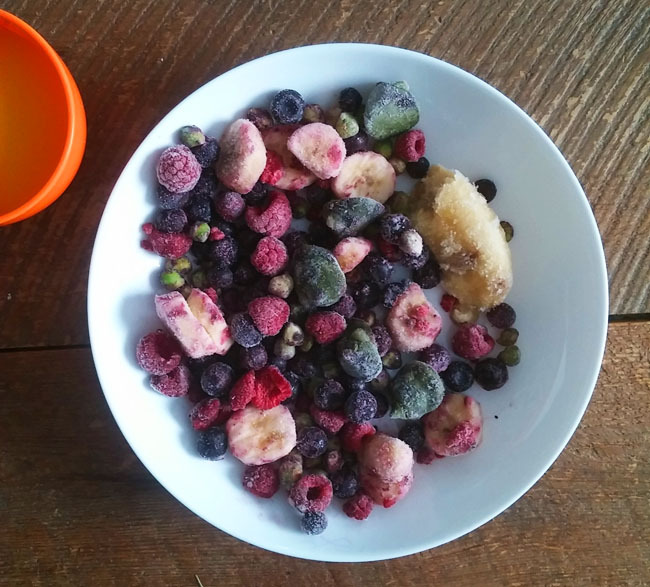 To satisfy my sweet tooth, I have been eating lots of fruit, both fresh and frozen. I got this mix in the photo above from the freezer section at Costco. Within one large bag, there are six smaller bags, portioned to make two smoothies each. Each bag contains blueberries, raspberries, green chickpeas, bananas and spinach. You simply add liquid (and another banana in my case). I also bought this non-frozen green mix at Costco. This Superlicious Smoothie Blend was in that freezing cold walk-in fridge. You know the one. The smoothie mix is a blend of carrots, red chard, Italian kale, shredded broccoli stalk and beet greens. You just need to add fresh fruit and liquid to make a smoothie. It turned out quite tasty with blueberries and apples. 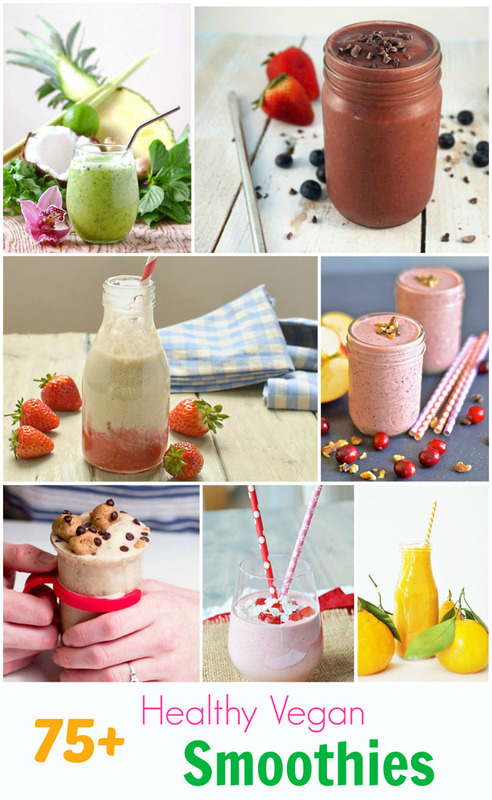 If you are feeling more energetic or don't have any such "smoothie boosters" on hand, be sure to try one or two of the 75+ smoothies I collected from talented blogger friends in this post. There is pretty much any kind of smoothie you can imagine. I also created this Peach Pie Smoothie Bowl recipe recently using canned California peaches. When fresh fruit is scarce make sure you have this healthy alternative in your cupboard. The peaches lend the dish a nice sweetness. 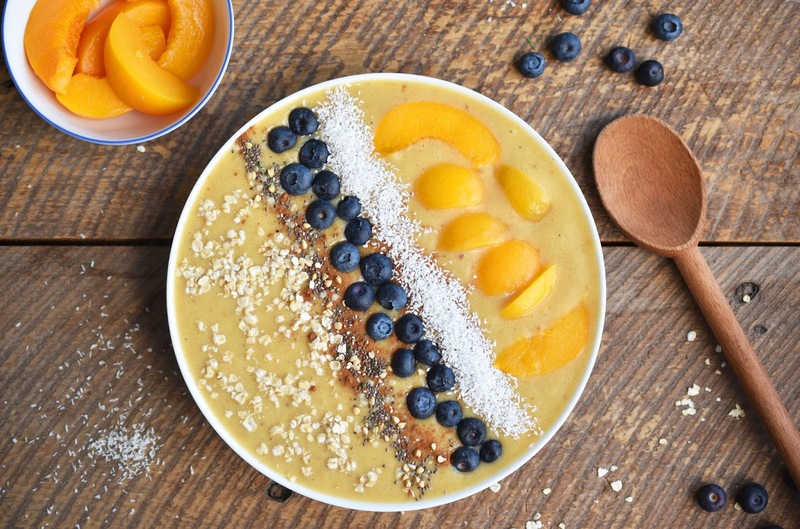 My kids enjoyed having their own smoothie bowls and choosing their own toppings. One of the vegan cookbooks I profiled is my original favourite - How It All Vegan. As I wrote about it, I realized that there are many recipes I have yet to try. So I was inspired to sample more recipes, like the vegan French toast made with psyllium husks, above. I have to admit I hit some trouble along the way. I think I let the psyllium sit in the liquid too long, because it got really thick and hard to cook. I managed to scrape some of it away as I went and rescued the French toast in the end. I'll have to try again more carefully. I have made some easy yet enjoyable meals over the last couple of weeks, like this rotini pasta with frozen veggies and beefless tips in a stirfry sauce of Bragg's, garlic, sesame oil and veggie broth. Now for a full day of vegan eats. 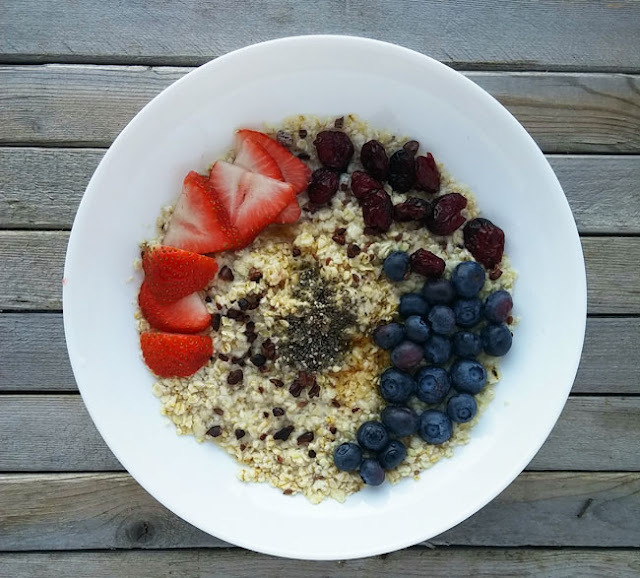 I started the day with instant flax oatmeal with blueberries, strawberries, cacao nibs, dried cranberries, chia seeds and maple syrup. I had cooked rotini left over from dinner the night before. 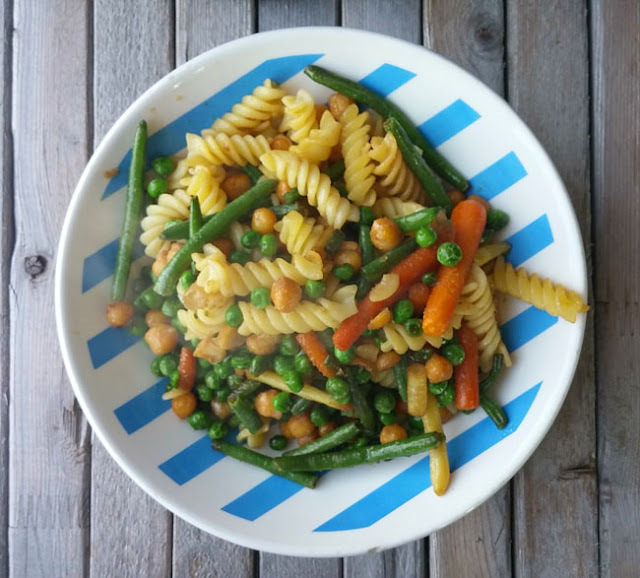 For lunch, I sauteed a mix of frozen carrots, green beans, yellow beans, peas and chickpeas and served it over the rotini with Bragg's liquid aminos and garlic. Dinner was a tortilla wrap with fake ground beef, refried beans, guacamole, mushrooms, tofu and salsa. I had an amazing treat in the evening that my daughter and my husband had picked up for me while out shopping. This Sweets From The Earth chocolate pecan caramel bar is so delicious - it's like a Turtle, but better - all-natural, vegan and gluten-free. I should have eaten half, but gulped down the whole thing. 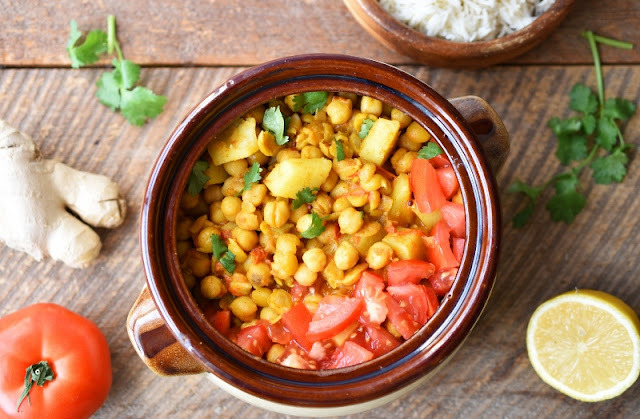 We also ate these Creamy Curried Chickpeas with Potatoes for dinner one night this week. 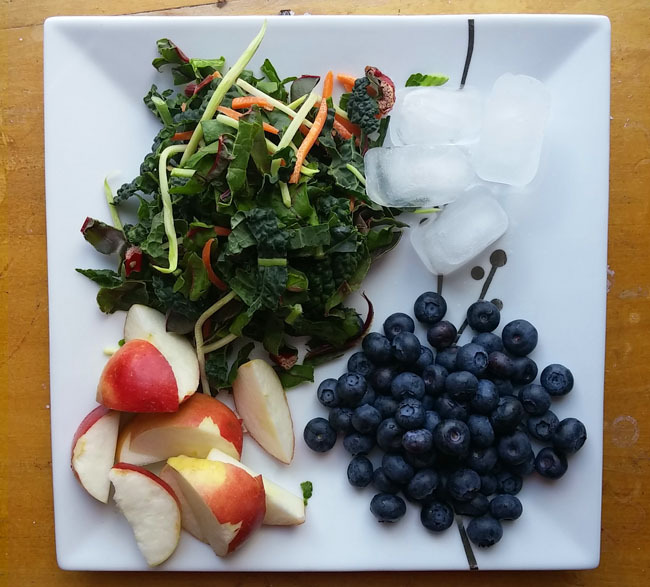 A simple, whole foods recipe for a healthy new year. My daughter and I have been snacking on fig bars. I like to have a cup of green tea with mine. 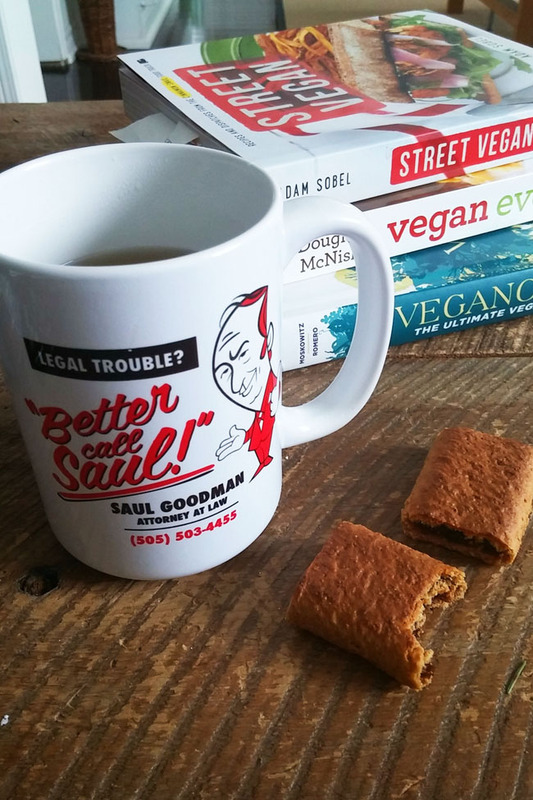 One day I decided to have my tea in the Better Call Saul mug the kids got my husband for Christmas, above. 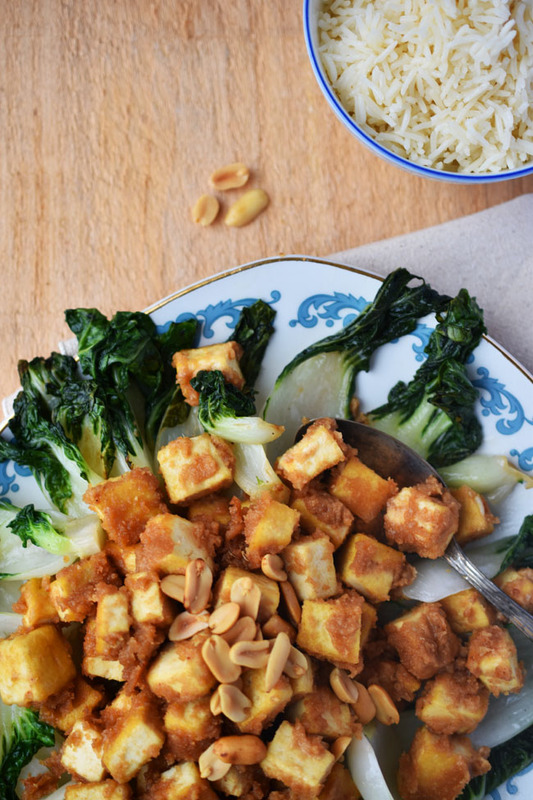 Another comforting, warming dinner recipe for winter is this Tofu in Peanut Sauce. 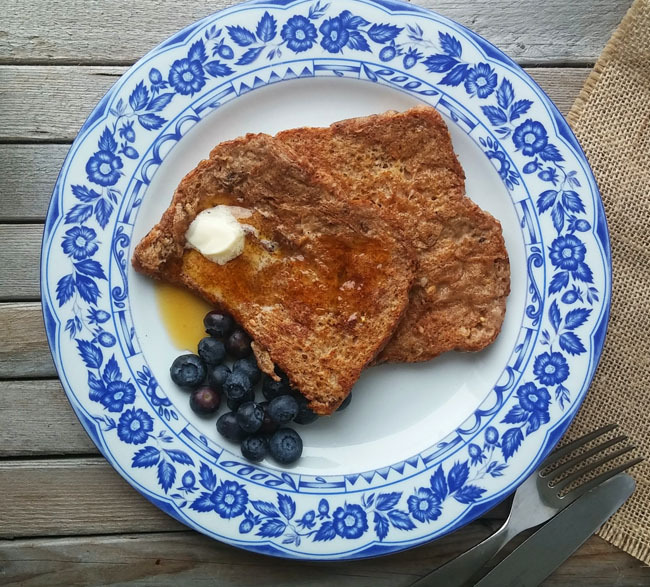 If you are in need of more recipe inspiration, check out the recipes I have featured this month from the cookbooks (and one detox book) I have highlighted on the blog this month. Clockwise from top left, Blueberry Tamari Greens Bowl from Salad Samurai, Coconut Yogurt, Berry & Hemp Heart Parfait from The Detox Prescription, Buddhist Noodle Bowl from Vegan Everyday, Roasted Cauliflower and Chickpea Tacos from Vegan Everyday and Pesto Cauliflower & Potato Salad from Salad Samurai. 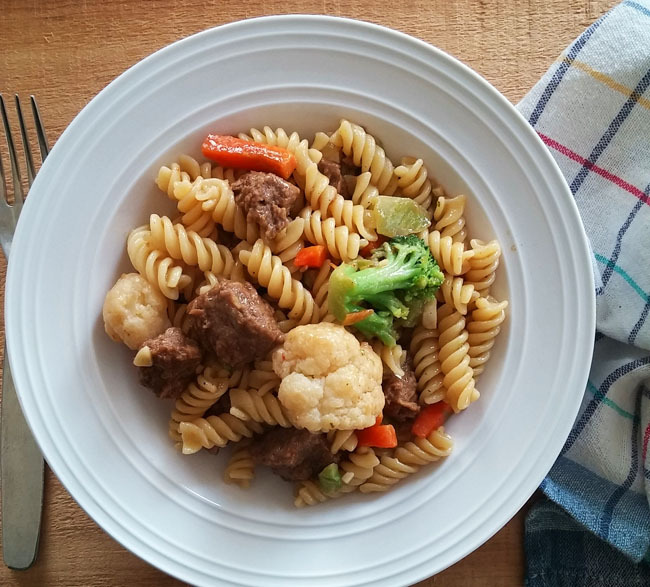 What have you been eating this January? ha yes, even on the other side of the world I know that freezing Costco fridge section too well! 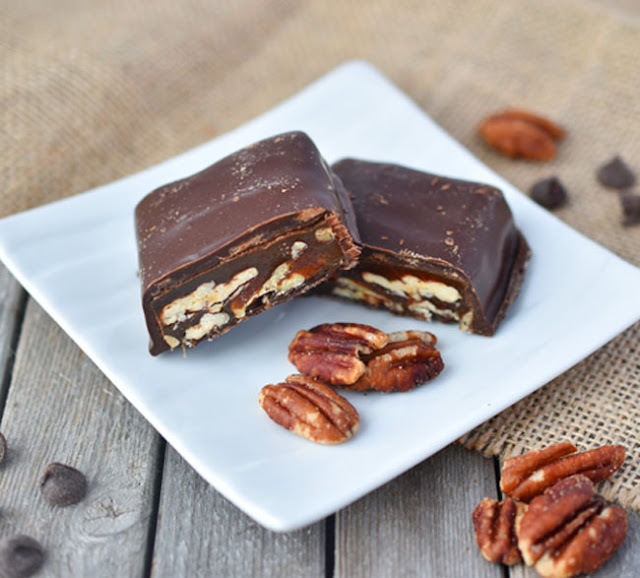 Great round up of eats, that pecan bar looks fabulous! Oh! That tofu in peanut sauce looks amazing! I have been craving some thai food - and that looks like it would hit the spot :) Once again - a really delicious looking week! Thai food...yum. I want to go out for dinner tonight, or at least Friday night for sure! But yes, try the peanut sauce! Thanks so much!